What Are Your Comic Plans For After Convergence & Secret Wars? As you may know, both DC and Marvel are doing major events this summer, with DC doing Convergence and Marvel doing Secret Wars 3. Some of us may be getting every single issue of both. Others are just waiting patiently for the events to end to return to their regular comics. Then there are others who aren’t affected by either of these because they read and buy comics from other companies and sources. Me personally, I’ve only read the Batgirl, Detective comics and Teen Titans Convergence comics though I am interested in reading the Question comic. I don’t care about Secret Wars and I am really wary of the Wonder Woman comic, which from the cover & description, really sounds bad (For those who have read it, I have judged it wrongly?). But that leaves the question of what to collect after these two events? For those who don’t collect DC or Marvel, this won’t affect you at all. But for others, some of your favourite comics may have been cancelled. As such, which comics do you think you will be collecting after these two events? For me, I will continue to read the Batgirl comic as I’ve been enjoying the new direction so far with the exception of issue #37. 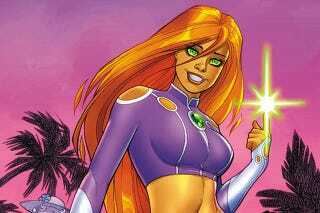 I will also be picking up the new Starfire comic as she is my second favourite comic character and from the previews, it really does look like the team seem to get what the character is about. As for Marvel, I really need to begin picking up Ms Marvel, which I’ll admit I haven’t read yet. Thors and the New Avengers look interesting, but I’ll wait until the reviews to see if I’ll be picking them up.